Hello welcome to this weeks blog. The next set of blogs are going to be dedicated to the products we sell here at Paulfolio Photography. I want to give you an in depth look at the kind of thing you can expect to receive when you book with us. Theres nothing better than seeing our work in print both from the photographers point of view and the clients. For us it makes me so excited to see all the hard work made into a physical form. For our clients it gives you a family heirloom, something to show off to your friends and family, something to be proud of. We offer a whole range of products from Canvas’s, Folio boxes and Albums, I hope to show you a bit more about each of these and what makes them special. I would like to start the ball rolling with Albums. There is something very special about having something physical from your wedding, something you can have out on the coffee table to show to others and reminisce of your wedding day. We use albums from a company in Poland, they offer the very very in quality products and they really do their best to offer a premium product. 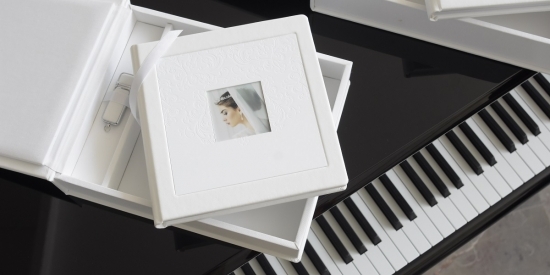 We offer a selection of different albums both in white faux leather and in a 2 tone linen finish. We don’t want to over complicate things by offering to many options, although we can offer other finishes at request. The albums are what is referred to as a lay flat book. This may sound confusing but it simple means that the pages are rigid card with no visible spine, this means that images can be printed across the spine without loosing detail. This gives us so many more options when it comes to designing your album, as we’re not limited to just one page when designing spreads. The White lady albums come standard as 20 spreads and the Duo Albums have 10 spreads. All of these can have additional spreads added, which gives you more options and of course more images in your album. We love seeing our work and your images in print.